Monday's post was about the insertion of an inappropriate word into a newspaper article. In that particular case the word was clearly visible, but it reminded me of the more subtle methods that disgruntled journalists have used in order to slip messages through sub-editors' nets. Acrostics have the advantage of being difficult to spot, especially in the high-pressure, deadline-sensitive environment of the newsroom. 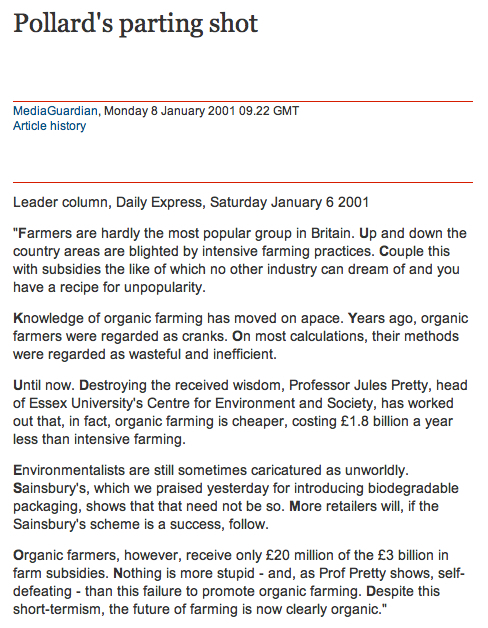 One of the prime examples is Stephen Pollard's parting message to Richard Desmond, the new owner of the Daily Express, in his final, apparently innocuous, editorial in that paper about organic farming. Difficult to spot, that is, until you've seen it. And then it stands out like a sore thumb. I have to make it clear at this point that the emboldening of the first letter of each sentence as shown above did not appear in the original article which, unsurprisingly, doesn't appear to be available online. Unfortunately for Pollard, his acrostic backfired. The Times, the paper for which he was leaving the Express, cancelled his contract as soon as his ploy became common knowledge. In fact, before he started his new job. On Friday at 6am there'll be another post. Get it first on Facebook and twitter. The links are at the top of the page.